The Kingdom of Kush was an ancient civilization in Africa. It is often referred to as Nubia and had close ties to Ancient Egypt. Where was the Kingdom of Kush located? The Kingdom of Kush was located in Northeast Africa just south of Ancient Egypt. 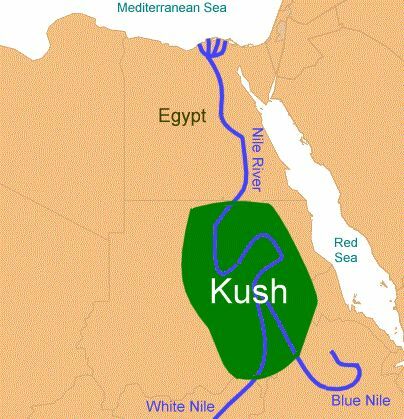 The main cities of Kush were situated along the Nile River, the White Nile River, and the Blue Nile River. Today, the land of Kush is the country of Sudan. How long did the Kingdom of Kush rule? The Kingdom of Kush lasted for over 1400 years. It was first established around 1070 BCE when it gained its independence from Egypt. It quickly became a major power in Northeast Africa. In 727 BCE, Kush took control of Egypt and ruled until the Assyrians arrived. The empire began to weaken after Rome conquered Egypt and eventually collapsed sometime in the 300s CE. The Kingdom of Kush had two different capital cities. The first capital was Napata. Napata was located along the Nile River in Northern Kush. Napata served as the capital during the height of Kush's power. Sometime around 590 BCE, the capital moved to the city of Meroe. Meroe was further south providing a better buffer from the fighting with Egypt. It also was a center for ironworking, an important resource for the kingdom. The Kingdom of Kush was very similar to Ancient Egypt in many aspects including government, culture, and religion. Like the Egyptians, the Kushites built pyramids at burial sites, worshiped Egyptian gods, and mummified the dead. The ruling class of Kush likely considered themselves Egyptian in many ways. Two of the most important resources of Ancient Kush were gold and iron. Gold helped Kush to become wealthy as it could be traded to the Egyptians and other nearby nations. Iron was the most important metal of the age. It was used to make the strongest tools and weapons. Outside of the Pharaoh and the ruling class, the priests were the most important social class in Kush. They made the laws and communicated with the gods. Just below the priests were the artisans and scribes. Artisans worked the iron and gold that was such an important part of the Kushite economy. Farmers were also respected as they provided the food for the country. At the bottom were servants, laborers, and slaves. Like the Egyptians, religion played an important role in the lives of the Kushites. They believed strongly in the afterlife. Women played an important role and could be leaders in Kush. Many of the Kushite leaders were queens. In battle, Kush was famous for its archers and the bow and arrow were often depicted in the art of Ancient Kush. Sometimes the region was called the "Land of the Bow" because of its famous archers. One of the most famous leaders of Kush was Piye who conquered Egypt and became pharaoh of Egypt. Most of the people of Kush were farmers. Their primary crops were wheat and barley. They also grew cotton to make clothing. The pyramids of Kush tended to be smaller than the pyramids of Egypt. The burial chambers were located below the pyramids. Many of these pyramids were built near the city of Meroe and can still be seen today. The priests were so powerful they could decide when it was time for the king to die. People didn't live very long in Kush. The average person was expected to live only 20 to 25 years. Besides gold and iron, other important trade items included ivory, slaves, incense, feathers, and wild animal hides.